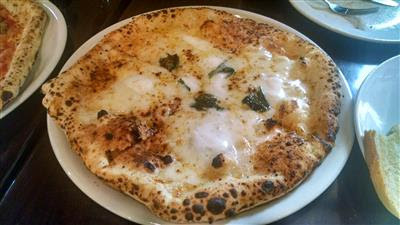 Mercurio's is one of our favorite restaurants. We don't get there too often since we live in the west suburbs and Mercurio's is in Shadyside. 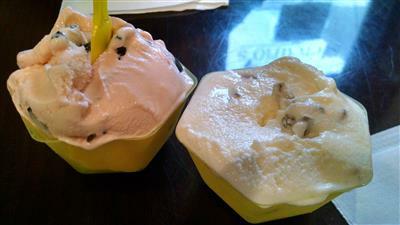 We try to go in the warmer months because, while pizza is delicious year round, I think gelato is best in warmer months. Or at least my stomach thinks so. We went 2 weekends ago on a warm and muggy Saturday evening. 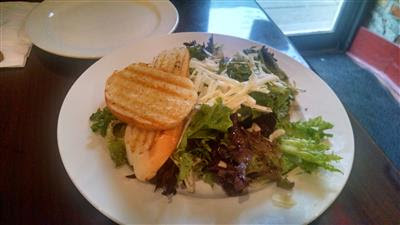 As usual we started off with the Insalata Della Casa, fresh greens with fresh mozzarella, tomatoes, parmesan, balsamic, and crostini. This time we tried 2 new-to-us pizzas. Above, the Quattro Formaggi (mozzarella, fontina, parmesan, provolone), and below, the Contadina (with eggplant and roasted red pepper). I was worried about the four cheese pizza because it didn't have marinara in the description so I thought maybe it would have garlic sauce but our server assured me there was no garlic, just pizza dough topped with the 4 cheeses, fresh basil, and olive oil. It was delicious! 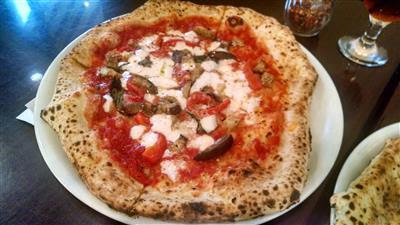 The eggplant one was really good, too, but for some reason we both couldn't get enough of the cheesy pizza. Black Cherry Bordeaux for me (left) and Sunflower Honey for SP (right). It's going to be hard for me to ever order a flavor other than the Black Cherry Bordeaux, studded with cherries and chocolate chunks. I love the combination. I liked SP's but didn't like that the sunflower seeds were soft. He loved his flavor. We hadn't been to Mercurio's since last September but the pizza and gelato are still delicious and the service is still terrific.